It has been five years since James was last on the show. After recently catching up with John on his own podcast, he’s here to share what’s working now. You can find James revealing other juicy business ideas on Episodes #4 and #47 (worth a listen for sure). Since then, he has sold his SEO business. Sold his website design business. He’s ramped up his coaching business, wrote a book, and now works less and makes more cash-eesh. He’s employing some new tools. James understood the value of segmentation. for both his clients and himself. The right support at the right time wherever business owners are on their journey. Email wise, he’s been focusing on list health. Listen to how he’s grown. What he’s changed to make everything more effective and efficient. In doing so he has found the sweet spot in his business. The people he can get the best results for and are easy to work with. James also talks about the effect his first, best-selling book has had on his business. And what he’ll spill in his upcoming second book. and make money with it immediately. Should you be doing live events for your business? James gives two powerful reasons you can’t do without. The game-changing effect James’ first book has had on his business. Email secrets of the P.S. and Dean Jackson’s “super signature”. Are your offers converting? The ways James is segmenting people entering his business. How he makes sure people see only what will help them now. 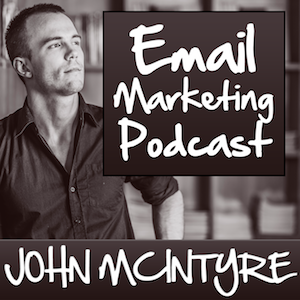 One big email metric James looks at which always leads to more sales month after month. David Allan: Yeah…I think this is really going to be exciting today because we’re going to talk about…dun…dun…dunnnn…email marketing, which is what this podcast is really about and you’re going to share something you’re doing with your own business and we’re going to bring it down to the technical side, we’re going to bring it down to what the emails actually contain – if you will divulge – and we’re just going to get into this right away. If people want to learn more about James we’re going to provide that near the end of the show but if you go back to the two earlier episodes you will hear more of his life story and what he offers through his SuperFast Business…business. James… let’s talk some email. Where do you want to start? This about you and what you want to share with our audience so where do you want to start?